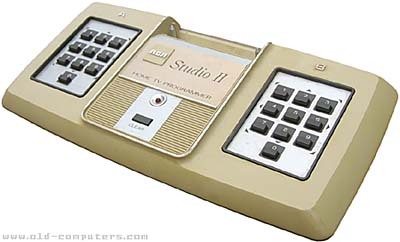 But the Studio II is more than a pong, it also is programmable. A total of 10 cartridges were released before RCA dropped the system in 1979. The Studio II also came with 5 built in games: Bowling, Freeway (car racing), Patterns, Doodles, and Math. Unlike Fairchild's system, RCA's was only in black and white and the sound was through a single channel "Pong" style beeper housed in the system itself. The controllers are quite basic: only two numeric keypads built-in the system, labeled "A" for left player and "B" for right player. The numeric keypads are composed of ten keys numbered from 0 to 9. Arrows are also drawn next to the keys to indicate that "4" is for left, "6" for right, "2" for up, "3" for up-right, etc. "0" is thus often used as the fire button (depending on games of course). Some years later, color clone systems appeared in Europe. They were clearly marketed as cheap systems for people who couldn't afford more "modern" systems like the Colecovision or Vectrex. They include the Soundic MPT-02 Victory, Hanimex MPT-02, Mustang 9016 Telespiel Computer, Conic M-1200 and the Sheen 1200 Micro Computer. Some have modifications from the original RCA Studio II such as detachable controllers or even color graphics. There were also some new cartridges produced for these systems, such as Concentration Match for the MPT-02. If you want to learn more about the RCA Studio II and its clones, click here. If you want to know how to build your own RCA Studio II switch box, read this. The RCA Cosmac VIP computer is also quite related to the RCA Studio II. see more RCA Studio II Ebay auctions !